Hi kids! Sorry for being sloooooow on getting part III up, but life has been busy. Happy new year to my Jewish friends! Hope this new year is 10x better than last year. Okay, on to the pictures! It's what you are all expecting from the blog post title! Playa Manuel Antonio. A free, public beach. It was beautiful. DanT's toucan drawing and our feet. I don't even think the feet-thing was on purpose! Your neighborhood Roadside Hawk. This, and the next bunch of pictures, was taken inside Reserve Manuel Antonio. A Halloween crab. Crazy, right? Look how bright! And they live in the park in moist areas. He looks so wise. And dinosaur-like. A Common Potoo. He looks like an owl. A sleeping Red-Eyed Tree Frog. Though, when sleeping his eyes look electric yellow! Awake Three-Toed Sloth! He/she climbed this tree! They don't move so slowly. We also saw a Two-Toed Sloth. If you want to know the difference, besides the number of toes, Two-Toed Sloths are white while Three-Toed Sloths are gray. Though they usually both have moss growing on them, so they really appear a bit green! Lizard. There are simply too many kinds in Costa Rica to remember all of their names. Sorry. White-Faced Capuchin! No zoom on this, they really came this close to us. Mommy Capuchin with her teensy baby!! Yeah... That's a Boa Constrictor from afar, thankfully. Representing Bold Native in Costa Rica! Sorry, Bold Native shirt, for sweating you up like I did. So beautiful out there, I'll even allow a photo of me in a bathing suit! 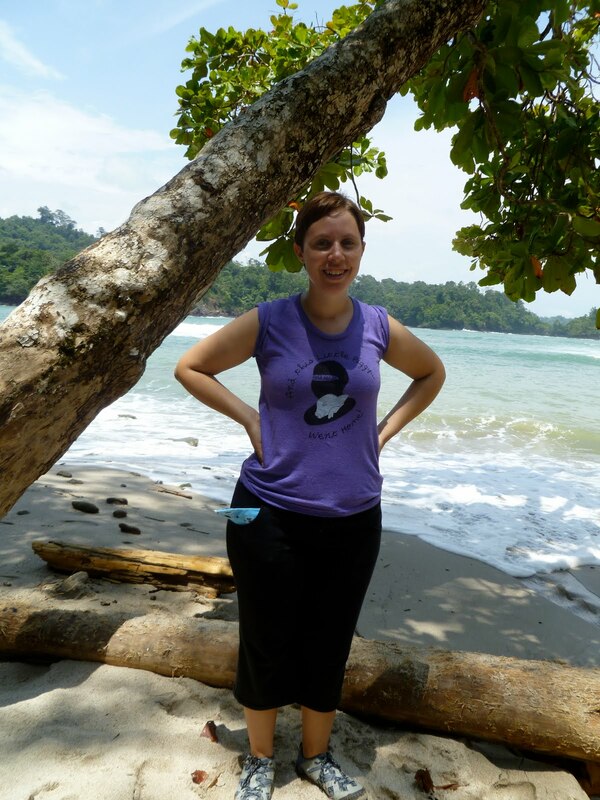 The one thing you potentially intrepid travelers should know about Manuel Antonio is that it is a big tourist trap. There is nothing authentically Costa Rican about it the way there was in Arenal and Monteverde. I'm glad this was our last stop as it was relaxing, beautiful, and full of amazing wildlife, but it is not how we will remember Costa Rica. Costa Rica, for DanT and me, was a place full of majestic beauty, amazing wildlife, and wonderful people. People proud of their country. People who respect their land and love their animals and understand that without those two things they, as a country, have nothing. My two favorite Costa Rica stats that I was told by locals there are that 97% of all their energy is created by alternative sources: water, sun, and wind. And that 10% of the country is government-owned nature preserve and another 17% is privately owned preserved land. Costa Rica, a tiny country with no standing army for over 50 years, has got it figured out. I look forward to going back someday. Well said Molly! 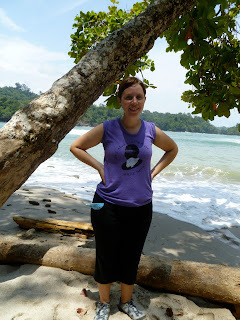 Totally agree about Manuel Antonio. Costa Rica is small but there is so much to see and do. Sometimes people are better off staying away from the overly touristed sites. Great pics! Hi. I stumbled across your blog after googling "vegan manuel antonio" -- my bf and I are both vegan and will be going next month. Can you recommend any vegan friendly restaurants in the Quepos/Manuel Antonio area? Great blog, btw. Really great news!!! this information is well worth looking everyone. Good tips. I will be sharing this with all of my friends! Thank you for sharing valuable information. Without question DreasBeats.com is the number one place to buy beats online. We have produced Hip Hop Beats, Trap Beats, R&B Beats and Provide Free Beats,Free Beats, Royalty Free Music. I'm gone to tell my more youthful kin, that he should moreover pay a smart visit this site page on standard reason to secure overhauled from most recent news. I really like and appreciate your blog post, thanks again. Want some more stuff.